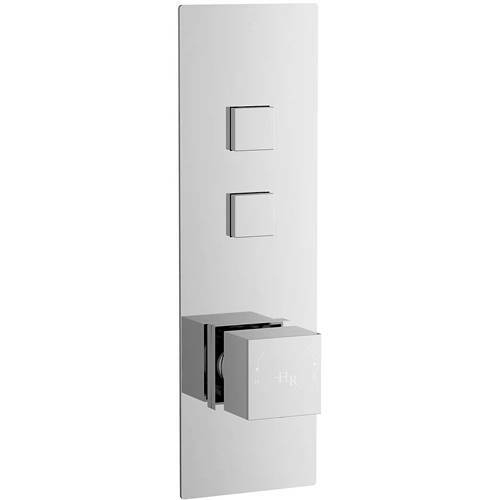 hudson Reed Ignite > Push Button Shower Valve With Square Handle (2 Outlets). Hudson Reed Ignite push button concealed shower valve in chrome with square handle and 2 outlets. Simple push on/off flow controls with instant start/stop activation. Each button takes you direct to a dedicated shower outlet. Suitable for shower heads, handsets and body jets. Outlets can be operated in isolation, or enjoy both simultaneously. Built to the highest quality and standards. Two shower outlets (2 way). Flow rate at 2 bar l/m (showers): 19.7 litres. Flow rate at 3 bar l/m (showers): 24.9 litres. Size: 260H x 80W x 135D mm. Pipe size: 15mm (1/2" BSP). 20 Year guarantee: Hudson Reed guarantee this shower valve for 20 years. The Ignite range of luxury shower valves from Hudson Reed offers easy to use push button control and a sleek modern look. These showers are Made In Britain to the highest standards and build quality. Audited to ISO9001 standards, meaning each product is designed, sourced, evaluated and warehoused to the highest standard. Hudson Reed are one of the largest bathroom manufacturers in th UK. Began life in 1982 and has quickly evolved to be one of the country's largest independent suppliers of complete bathrooms.